This is my Dad. Over the years he has taken some friendly ribbing about his enthusiastic Christmas decorations. It got worse once Christmas Vacation was released and we now had a name to lovingly hang on my Dad – Clark W Griswald. My Dad had so many cutouts, lights and decorations on our yard that they actually spilled over to the neighbours yard. We grew up in a small town, and I have vivid (and sometimes embarrassing) memories of the traffic being backed up on our street Christmas Eve, flashbulbs popping as strangers took pictures of our house. I’m certain the flashes were redundant. A few years ago, my retired parents moved from the town I grew up in to the town they grew up in. A province away. I thought that would have been the end of the decorations, considering they alone would probably fill a 1 ton U-Haul. But Dad packed them all up and took them and has continued the tradition at their new home. As I get older with my own kids and spend more time in my childhood memories than is probably healthy, I have come to deeply appreciate this tradition that my Dad worked hard to carry on. Traditions are important. They are the glue that holds family together across time. 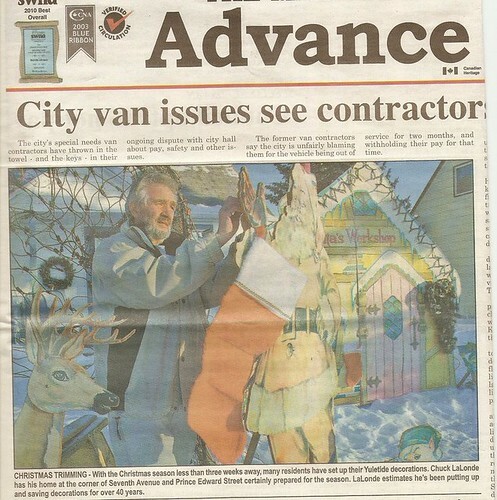 And as the years go by, I have this feeling of pride in the fact that my Dad brought smiles to many faces, and probably contributed to a few other families Christmas traditions – the Christmas Eve drive-by of the Lalonde house. This entry was posted in Dad to Dad, My Kids and Family, Uncategorized. Bookmark the permalink. You're dad's awesome. You're fortunate to have him.